This has to be one of the best books in my collection and runs to 128 pages. The first half of the book explains a multitude of useful watercolour techniques, as well as how to get the best out of the Terry Harrison’s Complete Brush Set for Watercolours (12 Brushes) which I’d received as a Christmas present. It was my first attempt at this demonstration piece and it turned out much better than I expected. Where do I begin? I learned so much! This was the third painting that I had tried from this book, and as with the others, there was plenty of forward planning to think about. I gained new practical knowledge about the importance building up layers and applying glazes, because as each successive layer is built up on top of another, on completion the intensity of the pigments positively brings the painting alive with colour. I also learned not to worry too much how the early stages look, because although Terry’s technique of stippling in leaves and undergrowth seems quite messy to look at when you do it the first time, when you finish applying the final washes, glazes, scratching out and smaller detail, at the end, everything is brought neatly together. I love this style of painting, and Terry is a great teacher. Although there were many new techniques I had to take on board it was worth it, and I can assure you that I’m going to have a lot of fun working through the the other exercises in this book! If you’ve painted this Terry Harrison watercolour demonstration yourself, or would like to offer your feedback then please share it with us using the comments below. This is my favourite so far be sure to view the larger version you really get the feeling there’s a real bright sun burning away behind those trees. Thank you for your feedback Chris, it was a great fun to paint and the finished watercolour is a real pleasure to look at. Thanks to the generosity of my friends and family (especially around my birthdays and Christmas) I now have quite a collection of Terry Harrison books. I’m planning on picking one of the exercises over the next few weeks and I’ll post the results here. 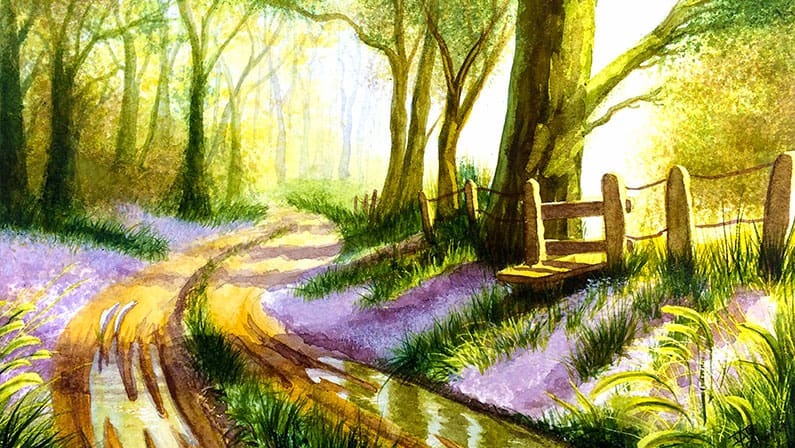 Is your Bluebell Wood Watercolours still for sale please?